This protocol describes the detailed experimental procedure for stem-loop S-poly(A) tailed RT-PCR using SYBR Green I. The procedure begins with reverse transcription of poly(A) tailed total RNA, or small RNA-enriched RNA, miRNA, siRNA, etc. The cDNA is then used as template for real-time PCR with gene specific primers. You may need to modify this protocol if you use different reagents or instruments for real-time PCR. In stem-loop S-poly(A) tailed RT-PCR method, total RNAs, including miRNAs, piRNA, or siRNA, etc. are extended by a poly(A) tailing reaction using poly(A) Polymerase and ATP. 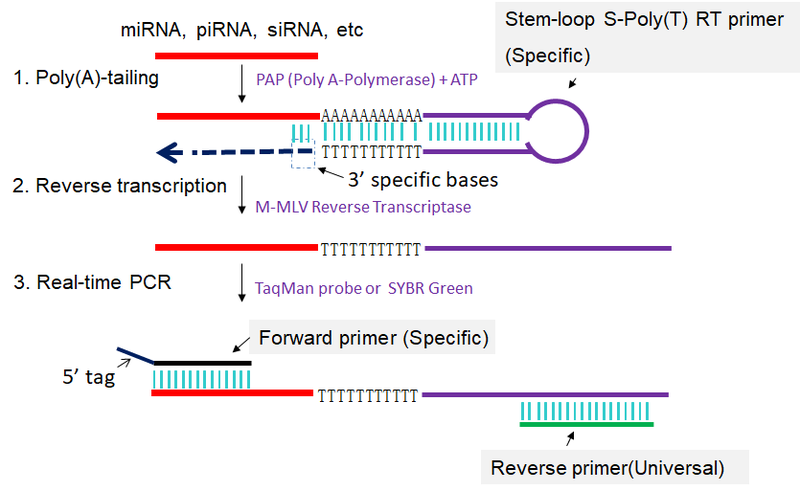 The sncRNA with a poly(A) tail is converted into cDNA through reverse transcription primed by a specific stem-loop S-poly(T) RT primer, and then PCR-amplified using a specific forward primer and a universal reverse primer (Fig 1). The RT-PCR amplification can be monitored by real-time detection or by end-point detection for quantifying the sncRNA transcript level. This method was invented by Dr. Shengsong Xie, and has applied for China Creative Patent (Patent applied number is 2016107850720). Fig 1. Scheme for stem-loop S-poly(A) tailed RT-PCR. 1: Poly(A) tailing of sncRNA using poly(A) Polymerase and ATP. 2: Reverse transcription of poly(A) tailed sncRNA primed by a specific stem-loop S-Poly(T) RT primer. 3: First-strand cDNAs of poly(A) tailed sncRNAs are amplified in PCR by using specific forward primer and reverse primer complementary to stem-loop S-Poly(T) RT primer. (5) M-MLV Reverse Transcriptase (RNase H-). (6) SYBR Green PCR master mix. (7) 50 bp DNA ladder. (10) Agarose gel electrophoresis apparatus. Reverse Transcription is carried out with the Poly(A) Polymerase (PAP) and M-MLV Reverse Transcriptase (RNase H-) for RT-PCR. The following procedure is based on manufacturer’s protocol. 2. Incubate the samples at 65 ℃ for 5 min and then on ice for at least 1 min. 4. Add the reaction mixture to the RNA/primer mixture, mix briefly, and then place at room temperature for 2 min. 5. Incubate the tubes at 37 ℃ for 30 min in a PCR machine, heat inactivate at 95 ℃ for 5 min, and then chill on ice. 6. Store the 10- or 20- fold dilution 1st strand cDNA at -20 ℃ until use for real-time PCR. 1. Normalize the primer concentrations and mix sncRNA-specific forward and reverse primer pair. Each primer (forward or reverse) concentration in the mixture is 5 pmol/μL. 2. Set up the experiment and the following PCR program on BioRad CFX96 Real-Time PCR. Do not click on the dissociation protocol if you want to check the PCR result by agarose gel. Save a copy of the setup file and delete all PCR cycles (used for later dissociation curve analysis). 3. A real-time PCR reaction mixture can be either 50 μL or 25 μL. Prepare the following mixture in each optical tube. 4. After PCR is finished, remove the tubes from the machine. The PCR specificity is examined by 3.5% agarose gel using 10 μL from each reaction. 5. Analyze the real-time PCR result. Check to see if there is any bimodal dissociation curve or abnormal amplification plot. 1. For end-point PCR, it is critical to amplify for an appropriate number of cycles so that 1) the PCR amplification product is readily visible on an agarose gel, and 2) the reaction remains in the exponential phase of amplification. The number of cycles required to meet these two criteria must be empirically determined. As a starting point, we recommend testing 15-25 cycles. 2. Analyze reaction products (10 μL) by electrophoresis on a 3.5% high resolution agarose gel in 1X TAE stained with dye for detecting dsDNA. Gene specific sncRNA amplicons should form discrete ~75 bp bands that are easily distinguished from smaller primer-dimer bands that may be seen in the no-template control reaction. 3. End-point PCR can be used for qualitative determination of differences in the expression of a given sncRNA between two (or more) RNA samples. In addition, a “standard curve” can be constructed to define the approximate magnitude of sncRNA expression differences between samples.